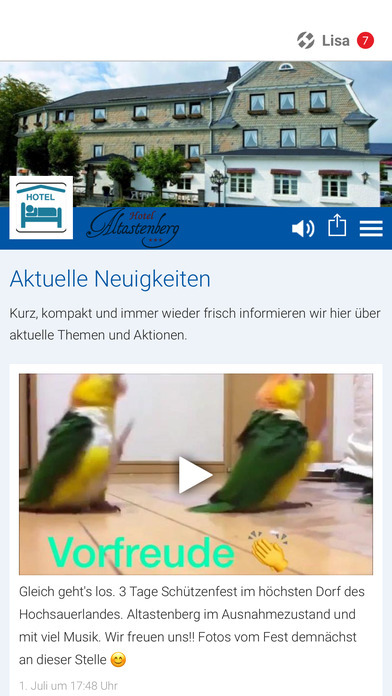 Hotel Altastenberg is located in the highest village in the Sauerland. Directly in front of our door, you will find it challenging ski area of Altastenberg. When you have parked your car, you do not use it again! Ski slopes, ski rental and a ski school are directly across the street, also a free shuttle bus to Winterberg and Winterberg ski arena is available. Since 1878, this traditional family hotel has opened its doors. Hotel Altastenberg located in the Winterberg ski arena with five ski areas (200 km of slopes), beautiful trails and several ski and snowboard schools. Located at the top of the slopes, this family hotel has a phenomenal view and you will be hosted in a friendly personal atmosphere. 38 rooms including two family rooms with connecting doors, all equipped with shower, toilet, hairdryer,& TV. A cozy breakfast and dinner restaurant, a lounge area with fireplace, private bar, pool table and dart board, a classic German beer stube, sauna (extra cost), sunny garden with terrace, children playground, parking and free use of WiFi (in public areas). The hotel is pet and smoke free. Even in the summer, this area is a perfect place to enjoy the forests and mountains, the extensive walking, cycling and mountain biking. Make a visit to the mines, monasteries, medieval ruins or the Fort Fun amusement park.